What Is a Deer Ked? 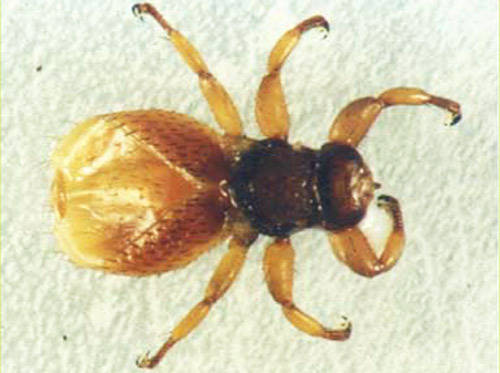 The deer ked is a newly introduced biting fly that is found on the cervid species including white-tailed deer and elk. It was discovered in Europe, Siberia and Northern China and has since been brought to the United States. It will also feed on cattle, pets and humans. Deer ked parasites are often mistaken to be ticks; although ticks are attached to the skin and do not move around nearly as much as the deer parasite which is commonly found on the belly of a deer. The deer ked bite on a human will go unnoticed for a little while (a very little while) as the body reacts to the fly's saliva. Within 15-20 minutes, the deer ked will engorge on the blood in approximately 20 minutes. Within three days, red bumps will emerge on the body followed by intense itching for 14-20 days. The deer ked does not have a vaccine nor a cure; and it is not fatal. Photo from the University of Florida, Entomology and Nematology.